Wouldn’t it be great to help more of your students improve faster and become awesome guitar players? Of course it would… this not only makes you feel good inside, but also helps you attract more students and earn more money teaching guitar. Assessing your students’ personality type, so you know what teaching style to use to help your students improve fast. Creating the right lesson materials to use with your students that are consistent with: their personality type, their stated goals and their musical strengths & weaknesses. Getting your guitar students to do what you tell them to do, so they actually make progress and become great players. Your students’ personalities fall into one of 2 basic types: strong and weak-minded. When you tailor your lessons to the students’ personality type, your students begin to improve very quickly. Answer: If you can’t figure out a students’ personality type quickly, it’s safe to assume that they are weak-minded. This is the personality of most people in general. Get started teaching guitar by avoiding these major mistakes. Your guitar students progress very slowly. Most guitar teaching methods (and books) were designed to explain musical topics, rather than help your students reach their specific musical goals. When your students don’t see the connection between the materials you teach them and their musical goals, their motivation to practice guitar goes way down. Because of problems 1 and 2, your guitar students may quit lessons with you sooner than they should. You will have a harder time attracting new guitar students. This is because your lessons appear to be no different and no better than every other guitar teacher in town. New students will have no reason to study with you vs. your competitors. Because of points 1-4, you will struggle to make good money teaching guitar. You deserve better and so do your students. Want to learn how to keep your students studying with you for many years (even decades)? Download this eGuide to keeping your students from quitting lessons and learn how to become the guitar teacher all students in your area brag about. Step 1: Change your mindset. 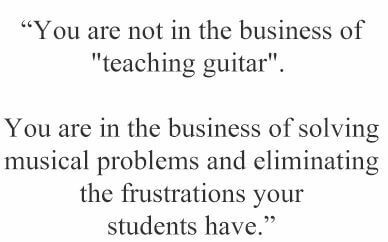 You are not in the business of “teaching guitar”. You are in the business of solving musical problems and eliminating frustrations your students have. This is why your students come to you and pay you money. Step 2: Identify what holds each of your guitar students back from reaching their specific goals. You do this by asking a lot of questions to understand each students’ situation before you teach them anything. 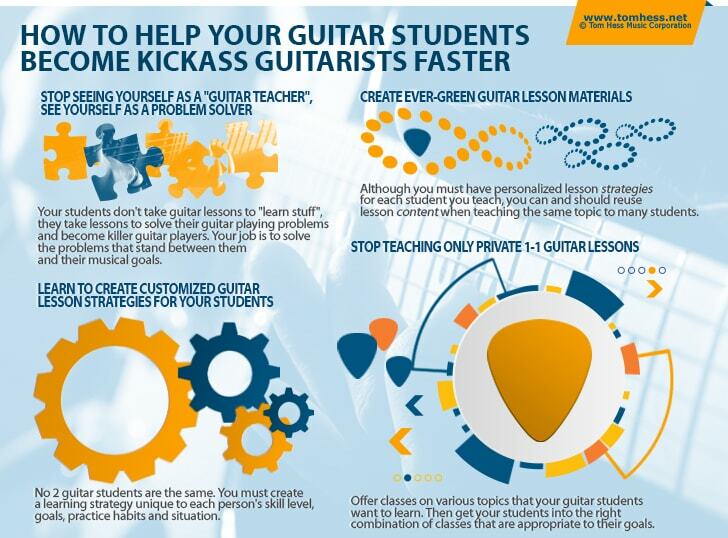 Step 3: Create guitar lesson materials that help your students reach their goals. These materials can be reused with different students in ways that are consistent with what they want to achieve (more on this below). Step 4: Offer classes that help your students develop specific musical skills they need to reach their goals. Get your students to enroll in the right combination of classes that are appropriate for their unique goals. This approach helps your students reach their goals quickly and reduces the number of hours you have to teach. Getting your students to do what you tell them to do is your #1 most important responsibly as a guitar teacher. Your ability to do this determines how quickly your students become good guitar players. 1. Have your students practice guitar during the lesson with you. This ensures that they practice correctly (because you are right there to give them feedback and prevent bad habits from forming). 2. Help your guitar students see why doing what you tell them helps them play guitar exactly the way they want. Your students are a lot more likely to do what you tell them when they are certain their efforts will lead to a big result. Part of your job as a guitar teacher is to effectively communicate the benefits of doing what you want your students to do. 3. Create a competitive environment among your students. When your students see other students around them improving quickly, they become motivated to work harder to keep up. This makes it easier to persuade them to do what they need to do to improve. Tip: group lessons create positive competition among your students. This is yet another reason why group classes are better than private 1-1 lessons. Your guitar students will become better guitar players faster because your teaching methods focus directly on their specific goals. As your students quickly become good guitarists, your positive reputation as a guitar teacher spreads around your local area and attracts new students to you. Because your students are improving faster, they are more likely to refer their friends to you for lessons. Want to learn how to keep your students taking guitar lessons with you for many years (even decades)? Download this free guide right now to learn how to keep your guitar students from quitting. About Tom Hess: Tom Hess is a guitar teacher trainer, music career mentor and rock guitar teacher online. He trains guitar teachers from all over the world to earn 6-figures per year teaching guitar in their local areas, while working only part-time. Learn how to improve your guitar teaching skills by getting training for guitar teachers.